Source: FSR Prod. Co: Toho Prod: Motohiko Ito Dir, Scr, Ed: Akira Kurosawa, after a kabuki Phot: Takeo Ito Art Dir: Kazuo Kubo Mus: Tadashi Hattori. Cast: Denjiro Okochi, Susumu Fujita, Masayuki Mori. Akira Kurosawa’s They Who Step on the Tiger’s Tail is a film version of a twelfth century Japanese tale which forms the central narrative of the Noh drama Ataka and the popular Kabuki play, Kanjincho. Along with Sanshiro Sugata (1943), The Most Beautiful (1944) and Sanshiro Sugata-Part Two (1945), this is the fourth film Kurosawa shot during World War Two. He completed the script in only a few days, and, adhering to the strict regulations of the Japanese military authorities, convinced the producer that he would shoot the entire footage in one location. However, the filming coincided with the end of the war and Kurosawa completed the shoot during the early days of the American occupation. They Who Step revolves around the conflict between the two surviving sons of the former head of the Minamoto clan. It follows the escape of Yoshitsune, a famous Japanese general, from a region under the control of his brother, Yoritomo. Yoshitsune and his followers, led by Benkei (his most loyal vassal), disguise themselves as Buddhist monks who are collecting donations for their temple. They arrive at the Ataka check-point, which is controlled by Yoritomo’s unit and led by the intelligent and suspicious Captain Togashi. The ‘monks’ must convince Togashi that they are real priests, and prove their familiarity with Buddhist teaching by ‘reading’ from blank scrolls. However, upon their departure, Yoshitsune (dressed as a porter) is recognised, and in an effort to save his master, Benkei, (with tears in his eyes) beats the ‘porter’ for being too slow. Although his suspicions are further aroused by this incident, Togashi allows the party to proceed, and later sends messengers with sake to the priests. When the danger is finally over, Benkei receives a pardon from Yoshitsune, gets drunk on the sake and dances. Kurosawa adhered to the historical character of the Noh drama with one major change that, according to some critics, alters the entire interpretation of the play. The director assigned the role of an extra porter to a popular Japanese comedian, Kenichi Enomoto. Enomoto is a serio-comic figure, a clown of rare sophistication who observes the feudal caste (of which he is largely unaware) with intense curiosity. 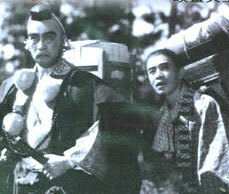 The result of this casting was quite effective, yet it produced a number of difficulties for Kurosawa. Japanese censors accused him of trivialising an important historical drama, and postponed the release of the film. Ironically, the American Occupation authority also delayed the film’s release, because they felt that it promoted a “feudalistic idea of loyalty.” The film finally reached cinemas in 1952, seven years after its completion. Kurosawa’s interpretation of the popular play demonstrates his belief that individual actions do not change the course of history, but may be more revealing than ‘accurate’ recording of historical events. In the Kabuki play, the role of Togashi is of particular interest. Togashi is an intriguing character who at some point seems to recognise Yoritimo’s brother, but fails to apprehend him. The debate about how much Togashi knows has been one of the most persistent controversies of the Kabuki theatre: Does he know the real identity of the disguised monk? And if he does, why does he let him escape? Donald Ritchie points out that the psychological drama in Kurosawa’s film centres around the rivalry between Togashi and Bunkei and their interpretations of the feudal code of loyalty (1). Kurosawa assigned the role of Captain Togashi to Susumu Fujita, who played the lead role in Sanshiro Sugata. Fujita plays a twenty-year-old trapped in Samurai armour, an intelligent young man with an emphatic sense of humour, thus making Togashi’s decision to Yoritimo’s enemies pass through appear even more enigmatic. Cinematographer Takeo Ito’s camera style reveals little about the mysterious group of Buddhist monks walking through the forest. The camera rarely shows the disguised general, sporadically capturing the fragments of his body. The use of specific editing devices which became Kurosawa’s trademark, also signal the directors desire to distance himself from the popular view. Ritchie points out that, since this film, Kurosawa started extensively using the horizontal wipe. This device will become particularly popular in his jidai-geki, or period films, continually reminding the audience about the constructed nature of his cinematic material. They Who Step was the first collaboration between Kurosawa and composer Tadashi Hattori after his three films with Seichi Suzuki. Hattori included music and dance in the film, following the traditions of Noh and Kabuki, but also composed separate musical accompaniment. The film opens with the party’s journey through the forest and the Noh music provides a historical context for the narrative. It concludes with one of the most significant Kabuki scenes, the dance of the drunken Bunkei, opening numerous possibilities for interpretation of the popular medieval tale. They Who Step is the last film Kurosawa made during World War Two. In his ensuing films, No Regrets for Our Youth (1946), One Wonderful Sunday (1947) and Drunken Angel (1948), his work gradually becomes more socially oriented, focussing on the dilemmas and disappointments of post-war Japan.